Holly over at Crisscross Applesauce in First Grade has sent me a Sunshine Award! It couldn't have come at a better time either....with the looming evaluation over my head (results to be learned AFTER the Thanksgiving break...ughh), the root canal that is coming in two days, and who could forget a week worth of kitchen duty (if my children were in here, they would say "she said 'duty'!" ...and I would giggle). Favorite color? This is going to make me sound like the dullest person EVER, but I really like the sepia tones. I have those, black and gray as my main color scheme in the living room and it is just very soothing. Favorite animal? Otters! Not River Otters, but Sea Otters....I don't know why... I have never even seen one up close, but they are just adorable....raise your hand if you thought I was going to say squirrel! Favorite number? 3 I like 3. With 3 children I am constantly trying to find things in 3s. Not exactly the same, but close. Favorite drink? Coffee! Coffee! and more Coffee! Facebook or Twitter?I don't even have a Facebook! I know, right, what a weirdo!?!?! It makes me nervous...and if I wanted to talk to people from my past, I would have kept in touch with them.....duh, maybe there's a reason I have talked to you in 15 years!!!! Your passion? my children. They are my world! I love the Mr. too, but he is on "my list" right now! Giving or getting presents? GETTING! GETTING! GETTING! Don't get me wrong, I love to watch my children open presents~ but there is something to be said for a surprise in a box! Favorite day? Saturday. It is the day that I do nothing because I have put it all of til Sunday. Heather's Heart I love your ideas and your blog helper! There are so many more! My google reader is blinking at me like crazy right now because it wants me to read all the wonderful things that were posted today! I hope you will click on over and check out these awesome ladies' blogs! They have all been a part of my class in one way or another in the last couple of months! Hey Staci! 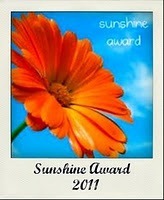 Thanks so much for the Sunshine award-you're so sweet! (And be sure to tell your "Mr." that I said so!!! lol) Your blog is adorable-I'll be giving you a big shout-out on my blog! Staci!! Thank you so much for the Sunshine Award! I was so swamped with work the last two days that I didn't even check my blog or email until tonight and there was your award!! You made my whole day! Thank you for the shout out and for writing such an awesome blog yourself! I love following YOU! Happy Thanksgiving and I'll be praying that your root canal goes as well as those things can go! Keep us posted on how your evaluation went, too! Hugs!